Is it time for Formula to take a pit stop? Stop the Formula One Championship! Just stop it! Finish up the season if needs be, but then put the cars up on bricks for a year; take the financial hit, then restructure and re-group in order that this ethically-challenged sport can regain its credibility. 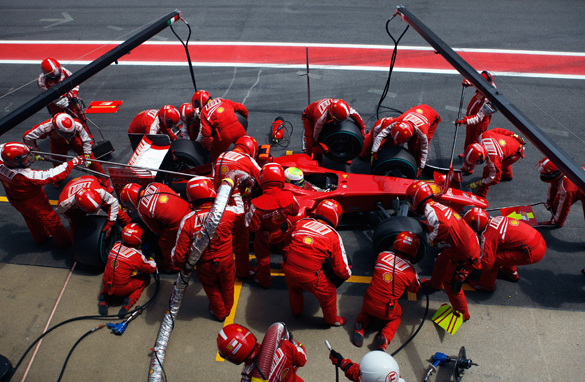 Should Formula One take a pit stop after a new crisis has hit the sport? If Renault’s admission that they did instruct Nelson Piquet Junior to crash his car at last year’s Singapore Grand Prix in order to facilitate Fernando Alonso’s victory is not an indictment of the lack of integrity in F1 at the moment, then I don’t know what is - chiefly for the reason being that this latest in a long line of transgressions by various teams and individuals in the sport was potentially deadly. Crashes, even pre-arranged crashes, are bad enough for the driver involved, but the potential for collateral damage to other drivers, stewards, and even the public is huge. What’s more, the possibility of chaos was increased at the Singapore Grand Prix, as it was Formula One’s first night race. And the question has to be asked -– it was all for what on this occasion? The chance for Alonso to gain a few points and his first victory in a year in a championship he was not going to win. Was the risk really worth it? The answer is obvious, and Renault truly deserve to have the book thrown at them for this infringement if the FIA, perhaps newly cautious after its run-in with FOTA earlier this year, is not to appear spineless and toothless. Of course, it’s not the first racing scandal to hit the sport. In fact, it’s not even the first this year to reveal questionable tactics among some of those competing. Lewis Hamilton and Mclaren having claimed that dubious honor in a lying and cheating scandal at the Australian Grand Prix. However, this latest admission is, to me, the tack that finally punctures the tires. F1 is now in such a state, that it’s surely surpassed cycling as the sport reputed to have the least integrity. Not among everyone. But, as usual, the deeds of the few have tarred the many with the same brush. So, like the Dakar Rally, which took a sabbatical to re-locate and re-group in the wake of extreme security concerns, I think it’s time for Formula One to take some time out to re-assess its standards. Because the way things are going it seems to be on a suicide course. Terry. While I agree with you that the scandals that have been occurring more and more frequently in F1 are mind boggling and indescribable, I would say that stopping it won't really do anything. the issue goes beyond that. With the hundreds of millions of dollars at stake, there will always be individuals and teams that will go beyond bending the rules. No one needs to look much further than the scandals in the US (baseball steroids) and the Olympics (doping). What is now required are drastic punishments such as suspension of individuals and/or teams for an entire season (or more), the consistent application of the rules (F1 stewards have been comical in the way they "apply" sanctions), and more transparency. If the telemetry of last year's Singapore race showed something suspicious as Max Mosley has said, then WHY is it just coming out??? No, the answer is not suspending the season. The solutions are much more systemic and will require an overhaul of the level of sanctions, the consistent application of the rules, and more transparency. Otherwise, a hiatus will only provide teams with more team to figure out how to game (at best) or how to twist (at worst) the system in their favor. It's been clear for some time that Bernie Ecclestone has lost control of his baby. He should hand over the reins to someone new who doesn't have a vested interest and who can whip the sport into shape( like me! ). Why throw the book at Renault? Briatore and Symonds has taken full responsibility. They didn't even try to lie to FIA. All indications are that Alonso and the rest of the team didn't know about it. I know that Piquet sr. tries to implicate Alonso by saying his strategy was "suspicious" but thats just stupid. Alonso had a fuel pump problem. Thats why he was only 15 in qualifying. He has started with a low fuel load for most of the races in 2008 and 2009. Look at the pre-race weights. Alonsos car is normally one of the lightest. Why should he be punished? And the 600 or so people working for Renault? What did they do? What I'm trying to say above, is that it's normal for Alonso to qualify as number 8-12 on the grid yet has a light fuel load for the first stint. The only reason F1 would need to take a sabbatical would be so it can figure out how to make the high-speed parade that is the average F1 race less boring. As for cheating, please! Cheating is a part of every single sport whether we admit it or not. Wherever there's an advantage to be gained, you can be sure someone will try to take it. And let's stop piling on cycling as the most tainted sport. How many MLB, NFL and NBA players would fail drug tests if those responsible for those leagues cared more about integrity than about the almighty dollar and set up testing programs even half as stringent as those already in place in cycling? In other words, no more track & field events, swimming, certainly no more cycling! Doping or manipulation, is there a difference? We are looking at competitive sports and irrespective of whether athlete/driver or manager/trainer, ways will be sought to improve results. I do not condone this conduct but it does not surprise me at this level of competition. Having followed F1 for over 40 years, I have to agree that this has been the most disgraceful year I have personally witnessed. I am sure that there have been other times when underhanded methods were used, but the Renault crash was particularly senseless and dangerous. In a sport where winning and losing is often decided by the smallest of measures, even a few thousands of a second per lap, it is natural to try to extract every possible advantage. As Stirling Moss once said, "I'll go right up to the edge of the rules to the extent that you couldn't get a razor blade in the gap." But that is not the same as crossing that line. One is fierce competition, the other is cheating. Please bite your tongue. F1 is one of the few true displays of technical achievement left in sports. NASCAR crashes cars for sport. You are not calling for the complete shutdown of that series, are you? The problem is that the sport has stopped being a sport. With millions being spent every week, a first win of the season would mean a return for Renault's sponsors (particularly as it was an F1 first – the first night race), and maybe keep Alonso in the car for another year. Having said that, I agree that a serious regroup is required, and a firm hand needed with Renault, if they are proved guilty of race fixing. The FIA threw Toyota out of the WRC for over a year for cheating, and they should impose a similar penalty for Renault if found guilty. It is very easy to understand that Renault F1 was facing pressures from corporate Renault, who wanted to see some victories, and feel it's money was being well spent. Obviously Briatore and Co. took this to an extreme level. Renaults little race fixing incident shouldn't incite rash moves, from alarmists. It should be a reminder that some teams are ruthless, and that the FIA should be even more cautious in monitoring irregularities. I am sure that this has happened in other motorsports. Race fixing will always be possible. There is no way to get rid of it. No amount of time off or regrouping would prevent this happening again, how would it? What will come in to balance the scales and make people think harder about doing it is what punishment Renault get. All competitive sport invites corruption. When the sport is on the bleeding edge of everything – finance, technology, power – all the bigger the invite for corruption. There is absolutely no sense in taking a year off. That's a sport which can't handle it's problems. And so it goes away for a while, with nobody knowing quite how it's dealing with them or 'restructuring'. If cars couldn't stay on the track because of a change in the laws of physics you might have a year off, but not because of a few cheats who are easy to deal with and will serve perfectly as an example of what happens to cheats. The article does not propose any solution to the problem. Instead of suggesting putting a brake on the championship, it would have been worthwhile for Terry to suggest some measures to plug the current conspiracies that have been dodging F1 in the recent past. True, that F1 has had a fair share of scandals in the recent past. Other sports have had their share too...even Tennis for that instance with the Hingis drug scandal, Serena's shody behaviour in front of a world wide audience at this year's US open. F1 is high on glamour and money. Drivers and teams are bound to make mistakes once in a while. There is no point in cribbing about the sport's integrity everytime a one-off situation occurs. My recommendation would be for Terry to stop following F1 for a year so that he doesn't have to put up with F1's lack of integrity. As for me, I love the spectacle and this year has been one of the most intriguing with a competitive field and each race throwing up surprises. Terry. I understand what your saying, but taking a year off will not solve the problem. This is a sport that I have loved and intently followed since 1995. There have been ups and downs since then and even long before then. There will always be teams trying to cheat or push the envelope of the rules. That's just the nature of competitive sports. The only true way to halt the bending or breaking of rules is to make the penalties so harsh that teams dare not push the limit. And that may not even stop them. I think that fans of the sport will just have to except that this type of action will occur occasionally. I'm willing to except it, because as far as I know, it's an exception. Just like cycling, which I also love, there will always be athletes and teams that think they can break the rules and get away with it. A 2 year ban for doping hasn't stopped all the cheats, but a lifetime ban may. So, maybe the FIA should consider such a harsh penalty, but please don't quit for a season. Stop the cars? And lose all the ridiculous circus acts that have masqueraded as sport all year? No way! If it wasn't for the threat of breakaways, Hamilton's lies and now Renault accused of deliberately crashing to fix a race, this season would have been tedious beyond measure. The track side action has been a snoozfest this year with KERS cars stopping any overtaking, a distinct lack of rain and almost no wheel to wheel action in boring new curcuits that no one has any affection for. Without the drama off the track I would have lost interest after napping my way through Valencia. Flavio has long struck me as a "task master" in this sport and it seems that over the years many drivers ( MS, FA etc., ) have driven a little "dirtier" when driving for him – perhaps now we know why – unscrupulous and illegal instructions demanded of drivers backed by threats of expulsion from a team seems to fit his "god complex" personality.... How long before the FIA starts to check with the bookmakers and Pro Sports Bet orgs to see just how much money was magically lost at the inaugural Singapore Race because of the those surprise results ??? F1 is in a state, sure, but it always has been, as it has always been run in the style of a dictatorship. Will they ever consider taking a year hiatus? Never. Would anybody consider losing many billions of Pounds of their own free will? Not unless they're completely insane. Good call, its a great sport being ruined and in desperate need of a serious make over. A "year shut down" is the best idea I have heard for the sport. Simple solution, ban all radio communication between pit lane and drivers. Go back to the days when the only communication between the team and the driver was via pit boards, this way it's open and honest if a little archaic. possible deaths in the picture. Not only the driver (brainwashed?) but the other drivers, stewards and last but not least: THE PUBLIC who paid (!!) for a ticket to see this circus. It is obvious that we cannot speak of autoSPORT anymore. It should be stopped. It brings nothing good to the world. It only costs a lot of money and environment. On the circuits we can make other usuful things. I would think that with this all but out in the open that it will now be discussion on whether Hamilton should have been awarded the F1 championship. As posted in an earlier post I would hope that since this event robbed Massa of his championship then it would be now necessary to right a wrong and either award Massa or at least take away Hamilton's tainted championship. b) Why even bother making this a Formula 1 issue, or even a sports issue? The anything-goes, end-justifies-the-means mentality permeates our entire society, and as long as it does, you'll have people trying to cheat at whatever game they're playing. c) It IS just a sport. I don't care how much money is involved, we're still racing cars, and watching racing cars. Stop taking it so seriously; who cares about its "credibility"? Did more people go hungry around the world because Alonzo won and Massa didn't? I love the sport as much as anyone, but there are real problems in the world that need to be taken more seriously than Formula 1's integrity. No sabbatical...........You act as though all sports are 100% pure. It is competition and EVERYONE wants to win it. When things go bad, you punish the GUILTY not everyone else also. Maybe Bernie needs to take a sabbatical and let someone else run it. Punish the guilty, reward everyone else. Don't be so ridiculously puritanical that you would cut off your nose to spite your face !! I would have thought that a native speaker is able to carefully read a press release. Renault did not admit anything. Renault said, that they won´t DISPUTE the allegations. They announced that 2(3) team members which were allegedly involved in whatsoeverm have left the team. And that they won´t say anything more before the FIA has felt a decision. It is hard to believe that soooo many intelligent people rather like to believe the words of a spoiled little boy – and that´s about it – than start to think about who could have an interest in putting pressure on Renault to get rid of Flavio Briatore. Is it a coinciedence that Alonso is always in volve. eg. text gate when he was at McClaren spying on Ferrari somebody else had to take the blame now crash gate. Alonso sholud be a man and own up. Well said F. A. Lewis, I am a big fan of Hamilton however, I think Massa should sue the pants off both Renault & Alonso. I do not think whoever is in support of formula 1 taking a so called PITSTOP is using their brain. If thats the case, every freaking sports out there where people have lied, used drugs and manipulated the system should also take a break. You do not live a perfect life, I know you have some skeletons in your closet like others, so stop pointing the finger. It's pretty clear that you are not a fan of Formula One, Terry. Somehow I doubt that a hiatus would change that.